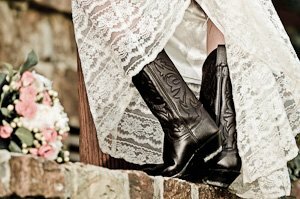 What can you do (besides hiring a great photographer) to have the best wedding photos? You want to make sure that your pictures will be memorable ones and you took great care in selecting your photographer based on its portfolio, past examples of work and so on. But did you know that you can personally have an impact on the final result? There are numerous ways to make sure your wedding pictures represent who you really are so that you don't end up with the same wedding album as everyone else! Here's a few: look, feel and locations choice. You are unique as a couple and there are some features to that uniqueness that you can put emphasis on. Let's say that you love the country lifestyle and you want it to be reflected in the feel of the photographs. Sure you will wear something like cowboy boots or a hat but you should also give consideration to the location where the shootings will take place. If you or a relative live in a ranch, it could make for a great background for both preparation shots and the formal portraits. Horses can also be a part of some of the pictures so does a great wild landscape. On the other end, if you want a more classic look, you should make sure that your preparation, portraits and reception shootings take place in refined location that all unnecessary objects in the room have been removed and that the remaining ones are adding to the classy feeling. Or maybe you're crazy about surfing and the ocean and your location choice should reflect this as well. Colour or its absence also plays a great role in the look and feel of you pictures. You should ask yourself how it will be displayed in your wedding pictures. We usually see best men and girls wearing similar colors but what if you are a little funkier than this and your own life is especially colorful? You could decide to include as much colour as you can in the both the clothing and the decoration of the location you will attend. On the other end of the spectrum, if you are more the rocker type then limit the palette of colour to black and maybe a touch of red. Of course you can be anywhere in between but consider being creative with colors! Light available and orientation. The best pictures almost always use natural light. When you choose your locations, preparation, portrait, etc, take a minute to think about their light availability. Better yet, take a few snapshots of the different locations you want to use and don't hesitate to ask your photographer if they are properly lit. A professional wedding photographer should be a good resource even before the event. Flashes are good tools for filling empty spots of an image with light or adding special effects but natural light has always been a favorite of top shooters around the world for decades. Small rooms force the photographer to use wide angle lenses and wide lenses tend to distort the image. This has both pros and cons. If you want the viewer to feel like he/she is inside the picture or give a funky feel to your image than a wide lens is not a problem. On the other hand, if you are after a more classic and refine feel, then you should consider having enough space available for the use of a non-distorting lens and allow more room for the photographer to work. Big spaces too have their advantages and disadvantages. They give room to work and flexibility to use different types of lenses but they can look empty if not shot correctly. Here again, good communication with you photographer will go a long way.